HOTEL WAIKIKI: Works in Progress .... see above (blog's banner). Works in Progress .... see above (blog's banner). I saw this guy in Longs Drugs (CVS) waiting for his owner to finish the heck up shopping. He really livened the store up. Awww... at least his owner takes him with him. They let dogs in the store now? Nate- when he stood up, he was a larger size retriever than I had thought. Nice fellow, though. Kay- the doggie was lying on the floor on another aisle in the store earlier, this was at the checkout. 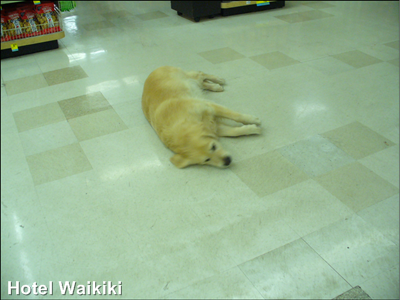 As soon as his owner made a move for the front entrance, to leave the store, the dog sprung up immediately. I gather, shopping wasn't his idea. Rowena- after midnight. So I guess they're more lax. awesome. Have you ever read the book "The People You Meet At Long's?" This should be in the book.